Galaxies are always a challenge… Imaging objects such as nebulas within our galaxy is much better suited to my small telescope. At 700mm focal length, galaxies over 30 million light years away are rather small and lack detail. 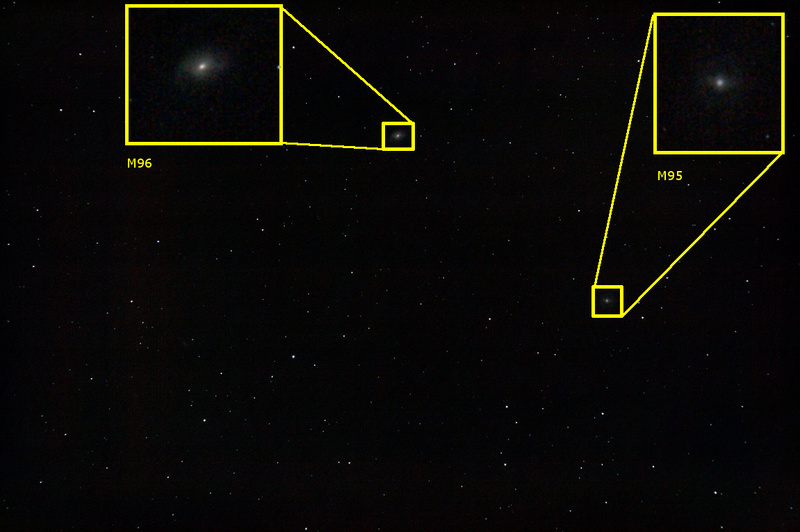 Nevertheless this is my go at Messier 95 and 96 in the constellation of the Lion. These galaxies were discovered by Pierre Méchain in 1781 with a 12in telescope, nearly 4 times the size of mine. The image was scaled to 30% and I’ve added insets of the galaxies. This entry was posted in Photo and tagged Astronomy, Astrophoto, Astrophotography, Galaxy, Messier by Benoit Guertin. Bookmark the permalink.